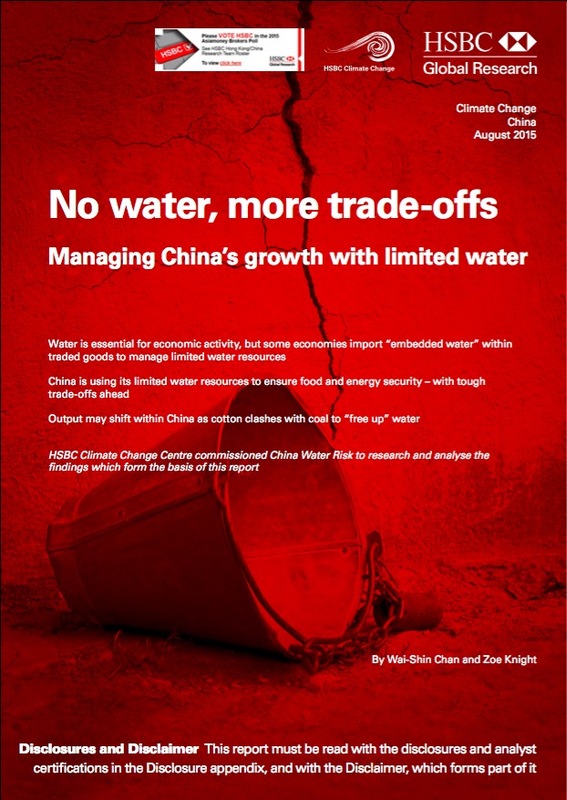 24 August, 2015 – HSBC releases report titled “No Water, More Trade-offs”. This new report is the 3rd in the “No Water” series of reports where China Water Risk was commissioned by HSBC Climate Change Centre to research and analyse the findings which form the basis of this report. This new report explores the relationship between water & economics and examines how China can manage growth with limited water resources. Can China follow the development path of some of the G20 countries? What is the optimum economic mix of industry, services and agriculture? Which industries and crops should stay or go? The report cautions that “tough trade-offs are on the horizon as China manages its water for economic development”. Given the need to balance water, energy and food security, regional trade-offs within China and between commodities are explored – in particular for cotton and coal. China could also choose not to mine more coal from water scarce regions in favour production in regions with more water resources such as Xinjiang. Findings are non-intuitive: “output may shift within China as cotton clashes with coal to “free up” water”. Read the report here (available to HSBC institutional clients only). China Water Risk will review these water-nomics & trade-offs in detail in our newsletter next month … sign up now ! China is moving to protect its water resources to ensure economic growth. This seminar examines how industry, energy and crop mixes will be affected as China pursues water, food, and energy security. Implications go beyond China with shifts in global trade. Can Asia pave the way to a circular economy? Join China Water Risk and HSBC for a panel discussion at World Water Week 2015, hosted by the Stockholm International Water Institute. Click here to see panelists and presentation line up.